Friday was the last day of school for my boys. Just like every year, they had fabulous teachers, and I wanted to do something to show how much I appreciated them this year. I know there is only so much hand lotion/apple crafts/mugs that a teacher needs. 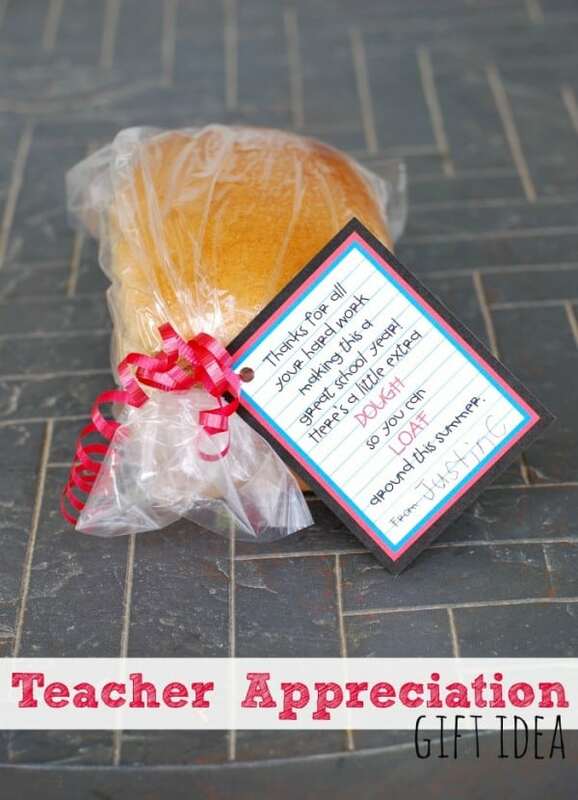 I wanted to come up with a teacher appreciation gift that they would actually use. I decided to do gift cards, because let’s face it, there’s not a single teacher on the planet that couldn’t use a little extra cash. Heck, everyone could use a little extra cash! I wanted to do gift cards from Target, but it’s 45 minutes from my house, so I ended up doing Walmart cards. In a pinch, I have also just taped some cash to the back of the card. 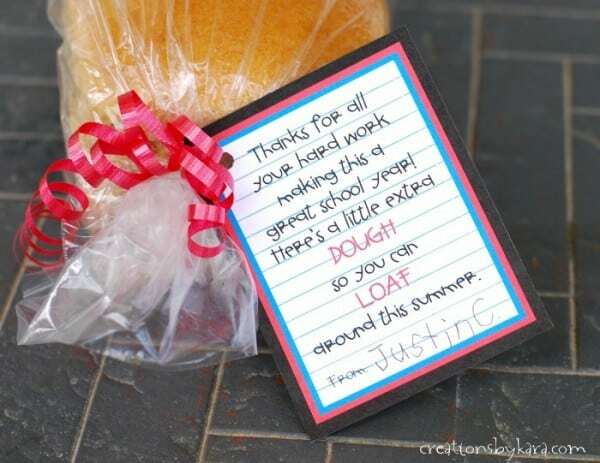 🙂 I wanted to make it a little more special than just handing over a gift card, so I came up with the idea of pairing it with a loaf of bread. 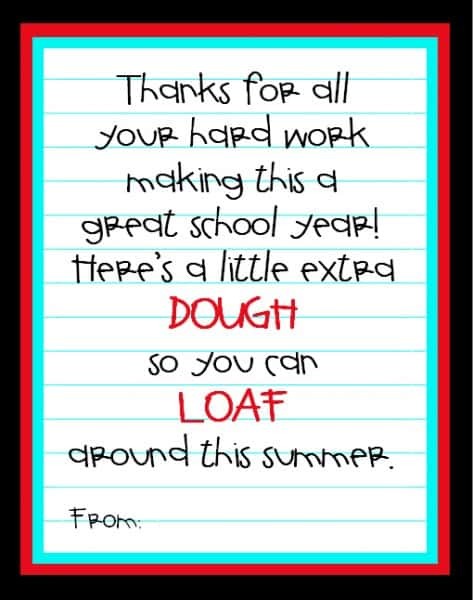 I know teachers tend to get a lot of sweets on the last day, so I opted for a loaf of homemade wheat bread. I came up with a printable gift tag that you can use. All you have to do is print it off, and tape a gift card or some cash to the back of the card. I think it turned out pretty cute! Kara comes through again! I was just thinking about end-of-school teacher gifts, and wondering what I might do that would be appreciated. I used your “reMARKable” Christmas gift, and now I’m going to use this one as well. Thank you!! I like how cute the tag is. I agree on giving something different. I like to give candles. Cute idea!!!! 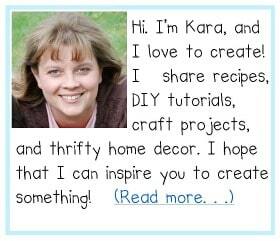 I am linking to your blog and featuring your flower clip today! your daughter is SO cute!!!!! Finally, a gift for a teacher that does not include a frame, crayons or ruler! I’m not a teacher, but really, giving a teacher a frame with crayons etc. is like giving donuts to the lady who works at a bakery! The bread is a good touch. Any amount in the form of a gift card is a great idea. Many school districts have not passed their levies and many teachers buy needed supplies out of pocket. Thanks for your post. You always have great ideas. Haha! So true. In the past I have actually asked my teacher friends what type of gifts they like to receive. School supplies and gift cards are always mentioned. And I will never give any teacher a mug or an apple craft. LOL! thanks for sharing that. its really cute.